Then they told me I had to either take a 50% pay cut or I would be fired. If I was fired they would give me severance. I didn’t like either choice. I had responsibilities. I was counting on the money. I was scared. I wasn’t expecting this. I was scared to go home. Not because of that sour taste of the next day already on my tongue, but the stark fear of what I would be thinking when I would wake up in the middle of the night. I had one month to make a decision. So I did “James-style”! I did not make a decision. I did not show up for work at all in that month. I heard just the other day that everyone hated me at that job because they thought I was too arrogant to show up. The truth is, I was afraid to show up because of a girl that I had started dating at the company, but it wasn’t working out and I was afraid to run into her. At the end of the month, they told me I was firedl but I was no longer entitled to the severance because I had let the month go by. They waited 32 days to tell me that last part. The severance would have been enough to keep me alive for six more months. Now I was dead. I called up HR. I called the CEO. I called my friends there. I was crying while talking to the operator. It turned out I no longer had any friends there. And the CEO’s secretary said he would have to call me right back, but he never did. There was nothing I could do. I had been stupid, fired, and now almost broke. Again. I hate being fired. And I hate hating being fired. It’s like I’m begging someone who despises me to please enslave me one more time. I said that to them. Then I needed money. I needed it fast. I had two choices: Panic or take action. When you panic, you live in your head. You sit there and go over and over and over again all the possible ways you’re going to die. But you can’t move. You always have two choices: Panic or act with calm. Once a day, I left my room and went to a gourmet hot dog place. I had a hot dog and then went back home and looked out the window for the rest of the day. I was frozen. Panic freezes you. Nobody is going to go into your head and take the panic away. But action leaks the panic out of your head. I don’t want to give advice. I just want to tell you what actions I took. Another time I ran a company that was acquired. The new owners wanted me to fire people. I refused. Eventually they fired me. “You disgust me,” said one of the people in charge. But I couldn’t do fire people. I was in love with everyone who worked there. When I say, “in love” I specifically mean there was one girl there that I wanted to marry. She worked for me. But she had a boyfriend and decided to stay with him. Now they are married. “You have to do it,” said my new boss. “If anything, this is the one situation where slavery is still enforced and you have to do what I say.” That same guy is a famous movie producer now. One of his movies grossed over $300,000,000. So that was the end of that job. Nothing ever works out when you are at the whims of others. It doesn’t matter if you are an entrepreneur or an employee. Anybody can be a prisoner. There are many people who would be happy to be your prison guard. Everyone wants a piece. Everyone wants their cut. They get their cut, and you get left to bleed. Recently, an entire company I knew went down the drain. I had many friends there. I don’t want them to panic. I don’t want them to feel that fear. So I made this graphic. I hope it helps. I hope people don’t freeze in panic. Please come out of your head and play with me. 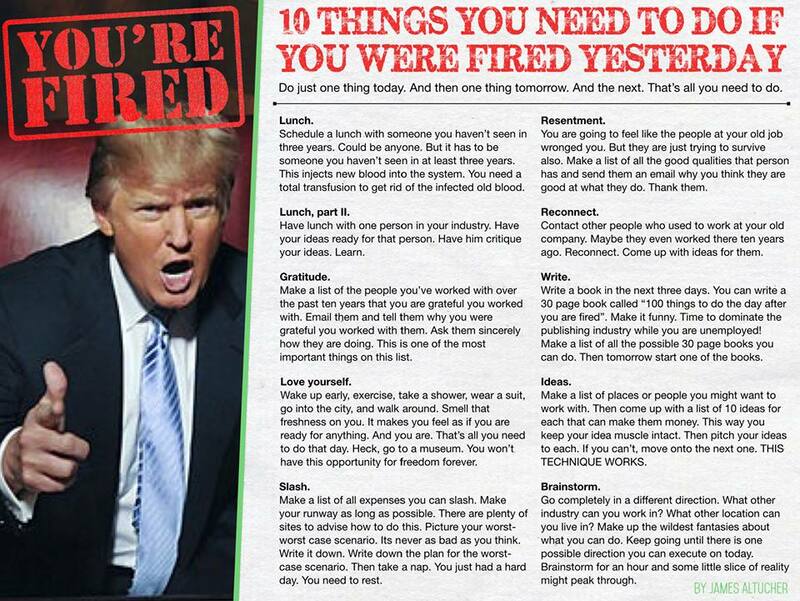 The author also wrote about the 10 Reasons To Quit Your Job. Read more from the author… James Altucher, an entrepreneur, investor and best-selling author of “Choose Yourself” and “Choose Yourself Guide To Wealth”. He openly discusses the financial and emotional impact of making (and losing) money in his personal blog at JamesAltucher.com.